YOUR PURPOSE IS TO TRANSFORM LIVES WITH YOUR COACHING, RIGHT? And you just know that there are perfect clients out there for you, and that they're hiding on Facebook somewhere. - If you could just figure out what to write that would get people to pay attention to your posts. - If you only knew how to get ideal clients to book calls with you, consistently. 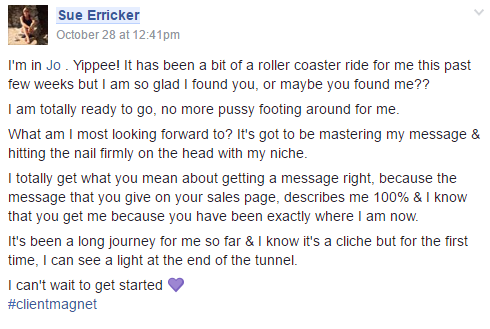 I went from being virtually unknown to hosting a thriving group of almost 2000 perfect clients and receiving daily messages thanking me for my posts. I went from scraping $2500 a month (on a good month) to consistently earning $10000+ each month. I wasted so much time on my website, while being careful to not attract clients, because I was worried about not having 'somewhere' to send prospects to online. As it happens, the first three high-end clients I signed had never even visited my site, and even today many clients sign up for $10,000 packages without ever going near my website. I used to spend hours and hours every day writing posts and blogs to share across social media and in my newsletters in an attempt to grow and engage my audience. And it did grow and engage my audience. 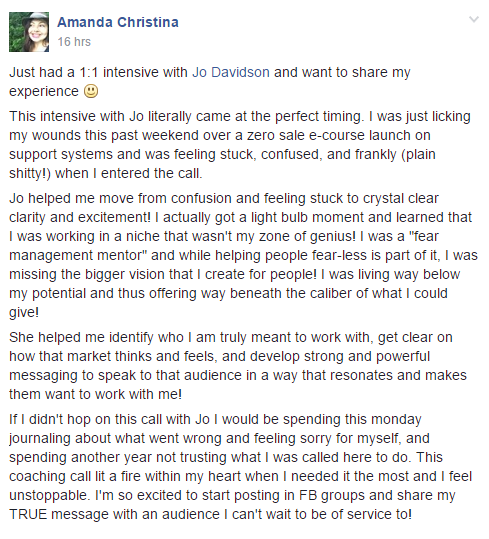 But, it didn't engage the right people in my audience (the ones who were ready to invest in coaching) and so it didn't get me any clients. 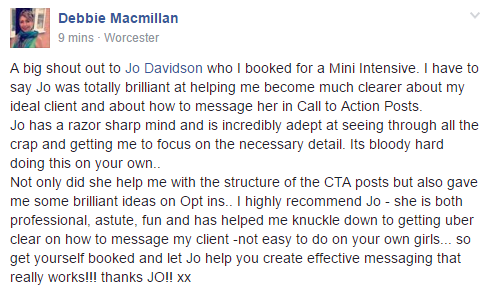 In fact, it was when I stopped blogging and reduced my social media activity down to one post a day (which takes around 30 mins a day) that my client attraction finally went into overdrive. Gulp! I wasted almost $3000 before I realised that Facebook ads are a waste of money until you have a good chunk of money to invest in them. After many costly attempts to get good conversions from Facebook ads, and consulting with a FB ads expert, I'd recommend that you don't put money into ads until you can get awesome organic results from your messaging AND have a marketing funnel that is already converting AND have a minimum of $20 a day to invest, in a single ad, over a minimum period of 3 weeks. And, even then, I'd still recommend hiring an expert to deal with them. As it is, until very recently, when I started to run ads again, I got my very best quality leads and every single high-end client I ever worked with, from free, organic reach in FB groups. 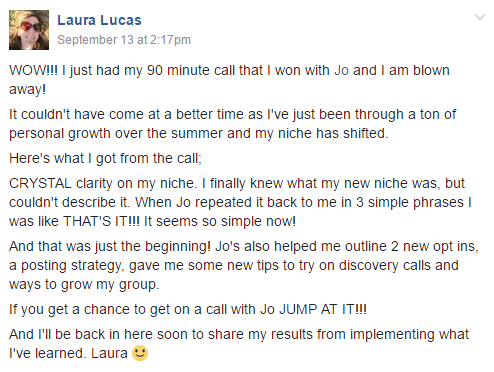 The first biz coach I ever worked with took $7000 from me and then recommended I create a $250 programme. As an unknown in the online world, I couldn't attract people to it and many just thought it was too cheap to be of any value. As a result, I spent almost 80 hours creating, marketing and delivering the programme, and only sold 11 of them (many of which were sold offline to networking contacts) netting me less than $3000. By contrast, my private coaching clients now pay $10,000 for 12 hours of coaching. LET ME IN! ​I AM SO FRICKIN' READY TO BE A COACHING SENSATION!!! Powerfully packaging your coaching so that you can finally feel great about charging your worth, while empowering your clients to excel. 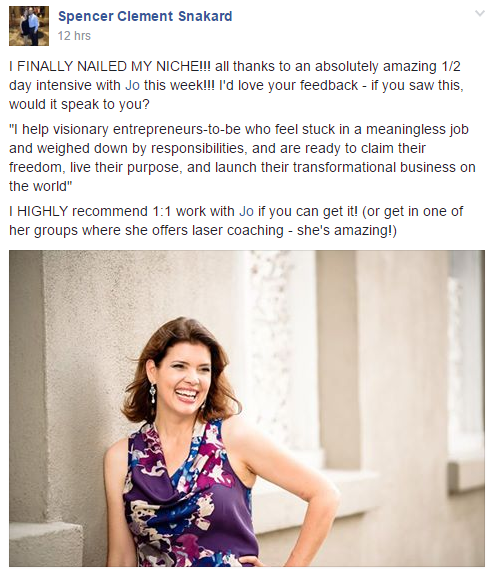 Once you've nailed your niche, having a high-end coaching offer that is perfectly designed to support your ideal client get the results they want more than anything, will empower you to feel great about prospering in your coaching biz. Leading sales calls and overcoming objections, without being pushy, so that you can hear "Yes" more often!Turning up to every sales call as the expert and empowering your prospective clients to say "YES" to themselves, is the key to turning your marketing efforts into clients! 50 minute 1:1 session with me, providing additional laser coaching for any aspect of your biz journey. This is the last time I will be running the programme at this price. Since it's the first time I've expanded the programme to 6 months - giving you more time with me and more opportunity to implement what you learn and start signing clients - I've decided to keep the price increase as low as possible. This is a one off price, and when we relaunch in Summer 2017, I'm going to be raising the standard price to $3,500 (currently $2,500). So, if you're unable to come up with a way to make the investment now, then it's probably going to be even harder to come up with the it later, after another 6 months of struggling to get clients. Perhaps a better question would be, "Can you afford not to join this time around?" What time will you be running the live calls?